It is February folks, can you feel the love! 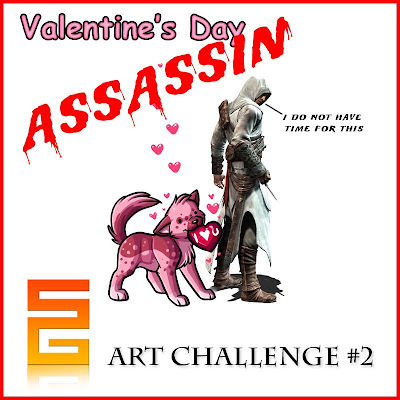 We'll be taking on the odd, yet intriguing challenge of sketchin up a Valentine Assassin character. Because of the randomness of how this idea even came to pass, we're leaving this one open to your fruitful imaginations to come up with something sweet. The character, or characters, can be anything as long as there's something to do with both valentines (Faye, Jill, Vincent, and Ivy all count ;) and assassins in the pic. Is your character a deadly assassin that kills only on valentines day? Or how about a character that's been inflicted a head-shot of love by their secret assassin crush.. Either way, these should have some pretty cool stories behind them. So wind up the gears and figure out what you're gonna do.. You've got another 2 weeks and funny enough, this'll end RIGHT after the fated Hallmark holiday, Monday the 16th.